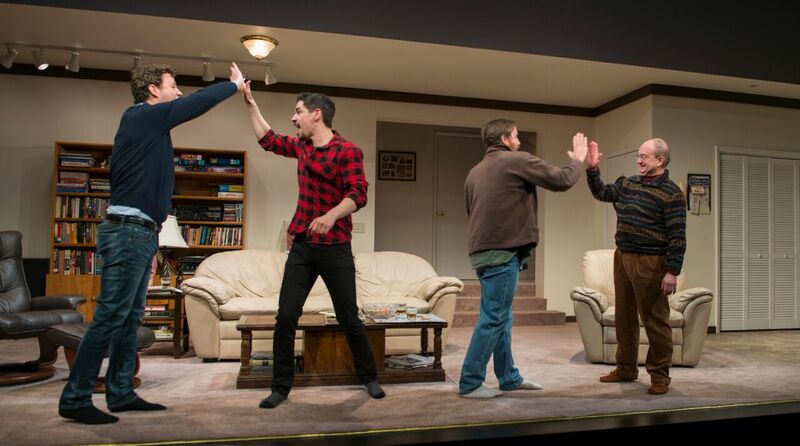 Review “Straight White Men” (Steppenwolf Theatre): Oh, Brothers! 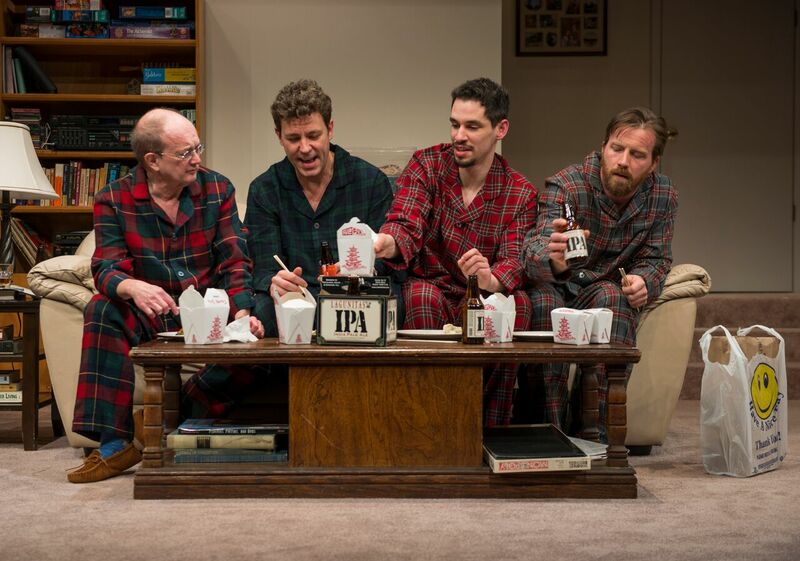 Steppenwolf Theatre presents the Chicago premiere production of STRAIGHT WHITE MEN. Playwright and director Young Jean Lee takes us home for the holidays. A widower (played by Alan Wilder) hosts his three adult sons Madison Dirks (Jake), Ryan Hallahan (Drew) and Brian Slaten (Matt) for Christmas. The anticipated traditions like matching pajamas, Chinese take-out and movie night are on the agenda. Those playful customs are tangled up in more serious familial life expectations. Brothers and father have certain expectations not only how the holidays should roll out but also how each one’s life should progress. Jake is a successful banker. Drew is a successful author. And Matt lives at home with dad and just wants to be useful. Although the holidays are bursting with brotherly love in pranks and dancing, the interactions are tainted with an underlying disappointment in Matt, the boy genius turned slacker. On the surface, SWM could be a wise-cracking bromance. Dirks, Hallahan and Slaten find a comfortable camaraderie. The brothers’ interactions feels authentic. They teasingly torment each other with smelly feet to the face and light-hearted jabs to childhood memories. When one brother is hung over, the others are merciless in trying to make him hurl. One argument is resolved by dancing off the tension. And nod out to Slaten with some impressive moves during the living room floor show. Meanwhile, the kindly Wilder paternally hovers over all his kids being home. The premise could be the equivalent of a “Hangover” movie – the bros version. Within this holiday comedy, Lee places a cement layer of white male privilege. She introduces it subtly by pulling out a family game. The guys grew up on mom’s makeshift version of Monopoly called ‘Privilege.’ Although their maternal influence is gone, each of the men continue to live by ‘Privilege’ rules. The present day distinction is they determine success very differently. And no one any longer can simply define his role as being a thimble. Although I really enjoyed SINGLE WHITE MEN, I found the very end unexpectedly clunky and dramatic . It seemed an abrupt departure from the close-knit family we had gotten to know. My playdate did not like the show. He grew up with five brothers and found the interactions to be unbelievable. I grew up with three sisters and imagined all families have their good and bad emotional outbursts on the holidays.